Suny Old Westbury is a public college that is located on Long Island has been teaching higher education since it was founded in 1965. It's conveniently located just about 20 minutes to down town New York yet offers a quit peaceful environment sitting on about 604 acre's which allows student to learn in great conditions. Suny Old Westbury is very committed and actively supports financial resources for people who what to earn a degree. They offer personable services to all applicants to assist them in funding their college education. The History of Suny Old Westbury was originally led by 4 permanent presidents and three acting presidents. Dr. Harris Wofford, Dr. Clyde Wingfield, Ulric Haynes, Jr, and Dr. James Hall, president of SUNY Empire State College, today Dr. Calvin O. Butts, III is the president. The first class was made up of 85 students, from all over the nation in arrived in September 1968. Now days Suny Old Westbury educates about 3300 students form over 20 foreign countries and all across the United States. It has an alumnus all over the world of over 17,000 graduates. The college keeps an average faculty of around 122 and 82 percent have terminal degrees in their fields of study. Suny Old Westbury keeps its class sizes small offering 17 pupils to 1 professor ratio to guarantee a close personal learning atmosphere. This public college offers with 45 undergraduate majors and 16 minors in both liberal arts and professional fields. One graduate program, an M.S. in Accounting, is currently available. With degrees for: Undergraduate: Bachelor of Arts, Bachelor of Science, Bachelor of Professional Studies. Graduate: Master of Science in Accounting. If you are interested in enrollment note that requirements for admission are considered on a rolling basis. About 43 percent of freshman applications are accepted and transfer students earning more than 24 credit hours of college work will be evaluated based on that work. 60% of students receive either need-based aid or merit-based scholarships. FAFSA, an Institutional Financial Aid application, and a Signed Student Aid Record are required to apply for aid. Suny Old Westbury athletics is home of the Panthers with 10 Division III intercollegiate teams compete in the Skyline and East Coast Athletic Conferences. Suny Old Westbury has a wonderful childhood center called the Marcus Avenue Early Childhood Developmental. It's located at the College's Campus Center, offers childcare and an early childhood education program for children six weeks to five years of age. Committed to providing a safe and nurturing environment and focuses on social, emotional, cognitive, physical development of all children. The program area, consisting of seven classrooms, an indoor gym and a wonderful outside playground, is clean, safe, secure, and aesthetically appealing. It's geared to developmentally appropriate, child-centered activities, providing opportunities for hands-on, integrated learning through real-life experiences. Children will be grouped according to age, with small child to teacher ratio. Children identified with special educational needs will be integrated into each of the classrooms, as appropriate. Preschool program offers opportunities to develop early literacy skills, science and math skills and all of the readiness skills needed to enter kindergarten. Children are encouraged to communicate and problem-solve in an interactive learning environment. Learning activities offered at the center include: dramatic play, creative art and music, computers, science and mathematical experiences, development of communication skills and exposure to literature. With its toddler program offers daily interactive learning experiences in which toddlers will gain a "sense of self" and form significant and trusting social relationships. Activities to encourage learning of basic skills, communication and problem solving are also offered daily. There are plenty of things to do and see around Suny Old Westbury College. The area offers area parks & historic sites like the Fire Island National Seashore some 20 minutes away to the Christopher Morley Park in nearby Roslyn-North Hills, there are parks close at hand that offer serene settings for nature walks and picnics and trails ready for hiking and mountain biking. Arts music and theater, just a short drive of the college and of course some convenient shopping. Broadway Mall has nearly 100 stores, boutiques, service providers and eateries including such notables as Stern's, The Gap, American eagle, Old Navy, Lerner and The Limited and a 12 screen cinema, which features the latest movies and a variety of refreshments. Then there are the beaches offering white sands for swimming, boating, fishing or simply relaxing or taking a walk. 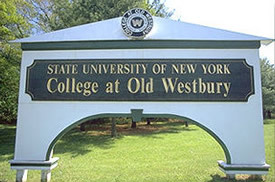 Suny Old Westbury is a great public college with a lot offer, a staff committed to helping with financial aid, a great curriculum of degrees offered and a wonderful location with plenty to do and see.